Regulatory measures are being brought to bear to help improve energy efficiency in buildings. The Building Regulations relating to new windows in home extensions are becoming increasingly strict, while the Code for Sustainable Homes sets out mandatory energy-efficiency standards for all new-build properties. For commercial and public-sector buildings, BREEAM environmental assessments set out similarly stringent guidelines. Homeowners are increasingly demanding energy-efficient products to help cut energy consumption and reduce their energy bills. 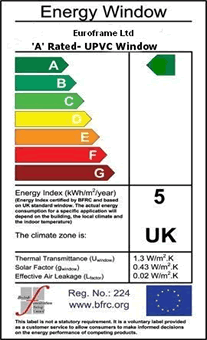 Furthermore, Home Information Packs (HIPs) now rate properties for energy efficiency on a scale from A to G, similar to that used on white goods. Windows themselves are rated for energy efficiency by the BFRC (British Fenestration Rating Council) on the same scale, making it easier for consumers to choose the best-performing products. At Euroframe we understand the importance to homeowners, builders and the wider environment of improving energy efficiency in buildings. That's why we have developed a range of advanced energy-efficient window systems that offer high performance, versatility and affordability. We can provide energy-rated window systems with BFRC ratings anywhere in the range from A to C, to meet individual requirements. Systems are available in a wide variety of styles to suit every property, from simple casement windows to innovative tilt-and-turn options and classically styled vertical sliders. We've even developed the unique Thermalogik outer frame system and PVC-U Thermal Inserts which create better performing 'A' rated windows offering exceptional value for money. Windows fabricated using Thermalogik profiles and PVC-U Thermal Inserts can achieve a U-value of 1.2 and a BFRC Energy Index rating of 9kWh/m²/per year, which means they will provide a net capture of heat during the year making positive energy gains and reducing energy bills for homeowners. Very few products can achieve this impressive performance.